With President Dr. Franjo Tudjman’s and HDZ’s political victory in 1990, which came after years of greater Serbian political agitation, legal abuses, ransacking of the Yugoslav Federal treasury, clandestine arming of a large swathe of Croatian Serbs, “meetings of truth,” and “spontaneous happenings of the endangered Serbian people” where stages, microphones, amplifiers and TV crews were on site before the “spontaneous happening,” it goes without saying that purges were to take place in intelligence and the police and other government sectors – where people were appointed much of the time based on Communist party loyalty and membership and not qualifications – and they did (it is important to note that more people were purged from the civil service, police and military after 2000 than in 1990 and immediately after – the bulk of those purged were Croatian Communists, not Serbs). Tudjman would have been not just inept, but insane, if he would have allowed people who either openly supported Milosevic’s policies actively, or those, specifically in the intelligence services, who openly or tacitly supported Milosevic and or did nothing to prevent or expose the illegal arming of Croatian Serbs by Belgrade, to keep their posts. Yet the lie about Serbs being fired simply for being Serbs prevailed during the war, and was yet again repeated at the ICTY despite more Croats being fired from the government and security apparatus than Serbs. Due to Tudjman’s and Croatia’s impossible international and domestic situation in the face of Serbian diplomatic and military supremacy, Serbia’s continual overt threats of violence to achieve its goals of “uniting Serbdom,” and Tudjman’s agenda of burying the WWII created Red-Black divide, it would have been unwise to crack down on the former regime members. Tudjman correctly chose to drive a wedge between them to use the professional abilities of those who switched to the Croatian side to help the cause for democratic state-building and deal with the criminals among them at a later date while leaving those who awaited the Yugoslav People’s Army “liberators” to take Zagreb, stare at the wall and wait for Godot with a red-star cap, forever. There were larger priorities at hand and a statesman must choose his battles carefully, based on timing. Those left waiting for a red-star capped Godot undoubtedly had people knocking on their doors – people from foreign governments and their respective intelligence agencies. Those same foreign governments were, to help legitimize their deliberate misrepresentations and bad, self-compromising and hypocritical policies, simultaneously were pumping money into a two pronged NGO strategy – one to promote an entirely parallel reality via NGOs they formed or funded to help form offshoots, the second, to allow journalists, diplomats and politicians to quote that parallel reality put forth by said NGOs and their subsidy recipients as if it was truth to influence or change domestic and international political opinion, and political outcomes. Spearheading the charge of NGOs in Croatia during the 1990s was the Open Society Institute (OSI), owned by self-described “humanist” and known currency speculator and billionaire extraordinaire George Soros. … Soros is friends with former Deputy Secretary of State Lawrence Eagleburger, the former U.S. ambassador to Belgrade and the patron of Serbian Communist leader Slobodan Milosevic. Eagleburger is a past president of Kissinger Associates, on whose board sits Lord Carrington, whose Balkan mediations supported Serbian aggression into Croatia and Bosnia. Today, Soros has established his Foundation centers in Bosnia, Croatia, Slovenia, and a Soros Yugoslavia Foundation in Belgrade, Serbia. In Croatia, he has tried to use his foundation monies to woo influential journalists or to slander opponents of his shock therapy, by labeling them variously “anti-Semitic” or “neo-Nazi.” The head of Soros’s Open Society Fund—Croatia, Prof. Zarko Puhovski (iiiiiivv), is a man who has reportedly made a recent dramatic conversion from orthodox Marxism to Soros’s radical free market. Only seven years ago, according to one of his former students, as professor of philosophy at the University of Zagreb, Puhovski attacked students trying to articulate a critique of communism, by insisting, “It is unprincipled to criticize Marxism from a liberal standpoint.” His work for the Soros Foundation in Zagreb has promoted an anti-nationalist “global culture,” hiring a network of anti-Croatian journalists to propagandize, in effect, for the Serbian cause. Form a shadow government using humanitarian aid as cover. Control the airwaves. Fund existing radio and TV outlets and take control over them or start your own outlets. Destabilize the state, weaken the government and build an anti-government kind of feeling in the country. You exploit an economic crisis or take advantage of an existing crisis — pressure from the top and the bottom. This will allow you to weaken the government and build anti-government public sentiment. Provoke an election crisis. You wait for an election, and during the election, you cry voter fraud. Take power. You stage massive demonstrations; civil disobedience, sit-ins, general strikes and you encourage activism. You promote voter fraud and tell followers what to do through your radio and television stations. Incitement and violence are conducted at this stage. Who else, one may ask, was funded by Soros? The recipients of generous funds include Milosevic’s unofficial rag in wartime Croatia, Feral Tribune, which simply recycled the prior week of Belgrade propaganda, as well as the bizarre Marxist magazine Arkazin, the Alternative Information Network of Former Yugoslavia, and a host of other media houses that failed on the market after OSI (Open Society Institute) ceased subsidizing their second rate agitprop, because they had no readership. Is it just these organizations that had or have ties with Soros? Croatian President Ivo Josipovic met in New York on Thursday the billionaire George Soros to discuss the situation in Croatia and in Southeast Europe and plans to renew activities of Soros’s Open Society foundation in Croatia. After the meeting, Josipovic told Croatian reporters that Soros was familiar with the situation in Croatia and the rest of the region and that he was interested in some information regarding the activities and financing of his projects in the region. The massive and nontransparent subsidizing of both the Social Democratic Party in the Parliamentary elections and the Croatian People’s Party member, Australian Croat check “misplacer,” YPA General Veljko Kadijevic collaborator, and the apparent ICTY perjurer Stipe Mesic, and Western NGO pro Mesic media jihad in the Presidential election cycle of late 1999 into 2000 was convincingly a continuation of Soros’s and foreign centers of power jihad to bring back the pre-1990 anti-democratic political elite structure. The reason was simple – they had no interest in promoting Croatia’s national interests, and were, and remain, interested only in power and the possibility to get wealthy in the process. The agenda was at this point, open: it was for a softer renamed Yugoslavia, minus Slovenia plus Albania, as was clearly outlined by Soros as he championed it publicly. 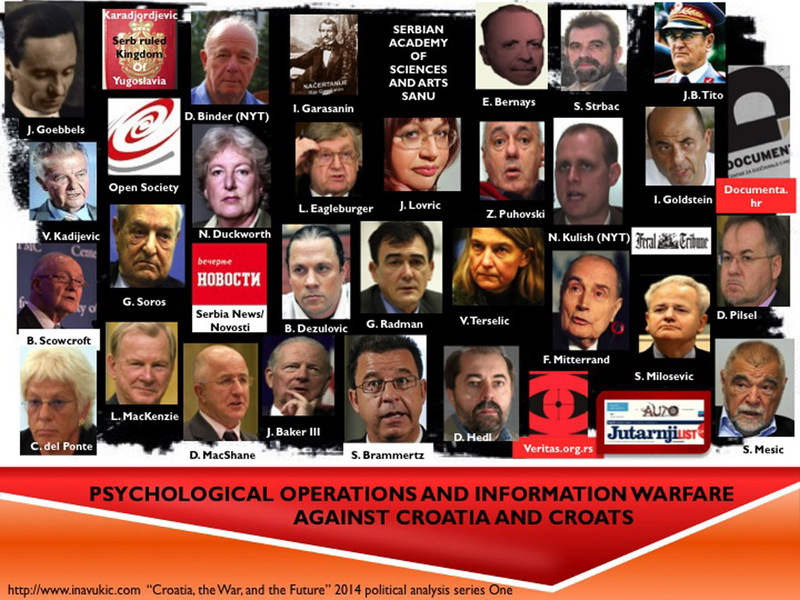 The most odious information warfare campaign was against General Ante Gotovina. Indicted in an ICTY indictment that was more or less built entirely on the agitprop of multiple Serbian military and political joint criminal enterprise participant Savo Strbac and his sham NGO called “Veritas,” whom the ICTY was working with since 1993 in a blatant conflict of interest that no major Western media outlet ever reported on to date. ii – It must be noted that Prof. Puhovski, a Tito regime false witness in the show-trial of the Croatian Spring participants, in particular Duško Čizmić Marović, chaired the Lustration, Public Debates on the Past und the Rule of Law Seminar in Zagreb, 17-20 February 2005, and published several articles on the topic of lustration in Croatia, more or less advocating at best a very soft form of it. iii – Zarko Puhovski testified against Croatian Generals Ante Gotovina, Mladen Markac and Ivan Cermak at the ICTY, claiming that the Operation Storm effects were “tantamount to ethnic cleansing.” His testimony at the ICTY, as well as the “evidence” provided by Soros-funded HHO, were thrown out of the trial due to unreliable research methodologies. iv – Here is a transcript of Luka Misetic’s cross examination of Professor Puhovski – no comment is necessary:http://www.icty.org/x/cases/gotovina/trans/en/090217IT.htm. v – Professor Puhovski also, along with current Croatian Ambassador to France Ivo Goldstein Jr. (who was sent to the post in 2012 despite not possessing the ability to fluently speak the language, but did not forget to bring a picture of Tito for his office wall), formed the Udruzenja za jugoslavensku demokratsku inicijativu (UJDI) [The Associations for the Yugoslav Democratic Initiative], a political front party for the Yugoslav People’s Army General Staff that was against Croatian independence, in addition European and NATO integration, two of HDZ’s stated political and strategic objectives. You have helped me understand the situation there.. I hadn’t a clue..
Hi, Ina. Looks like you’ve been busy since I was here last. Thought I’d Let you know that I’ve begun placing my music library online. So far, The Beatles and The Who. Congratulations, I have nominated you for the “Sunshine Award”. For details please go to http://ronnie-s.com/2014/04/06/sunshine-award-2/ for the details. I knew that humanitarian aid often didn’t reach those who needed it but wasn’t aware that it could be used as a cover. Very interesting but also troubling. Have a wonderful day, Ina. ….what I do NOT understand as to how these “Croatian” politicians are so grovelling and in such a hurry to sabotage Croatia and the Croatian nation!? Maybe they work for the Serbian UDBA, are “secret serbians”, possessed by the DEVIL or are full of self-hate? Why after so much bloodshed in Croatian history (although a lot of croatia’s problem are also the cause of the Croatians themselves eg King Tomislav and the Roman Catholic Church gave the “serbians” protection from King Simeon I of Bulgaria), why would Zoran Milanovic, Stevo Mesic, Vera Pusic, girly-man Ivo Josipovic, Zeljko Jovanovic (he’s one of THEM anyway so that’s expected and so is Rade Cacic et al.) be so FORWARD in destroying the Croatian nation? If Slobodan Milosevic and the Serbian Orthodox church expelled the Croats, Bosnians, Banat Hungarians, Montenegrins, Kosovars, these “croatian” politicians would washing dishes in Paris, London,Toronto,Chicago or Sydney—–that is if they escaped with their LIVES! Please reply! One of the reasons, Tempus Fugit, is in the fact that all these politicians are still communists at mind and heart and have not accepted the fact that Yugoslavia is no more. They do not love Croatia even though they pretend to and since Croatia has such pathetic excuses for politicians it is up to other Croatians to fight against their presence at the top.